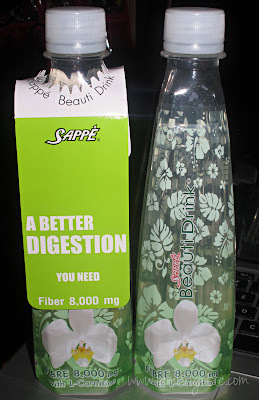 Have you heard about Sappe Beauti Drinks? I asked because when I first posted it on my Instagram, a lot of people asked what it is and where is it from. 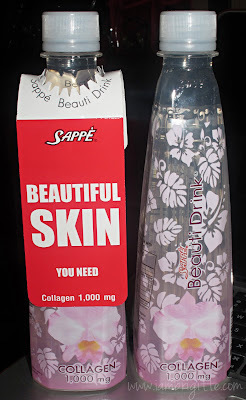 Sappe Beauti Drink is a functional beauty drink for people on the go. It's made in Thailand, and apparently, from the same company who made the yummy (and cute) Mogu Mogu drinks. Honestly, when I was asked thru email if it's okay to send me samples, I said Yes without reading more info about the product. Well, ako na ang atat! Anything about beauty (or beauti) interests me..so I gave them a go. When I finally got the box, and saw the packaging, I was a bit apprehensive at first. Well, vain na kung vain but you can't expect me to start downing a bottle just like that. I did some research and from then on, I try to have at least one of the two variants everyday. For those who want to have enough, healthy dose of fiber each day, then this variant is for you. A bottle is equivalent to 2 big pomelos or 8 tangerines. As you might (or might not yet) know, fiber is important to our digestive system...it also helps prevent intestinal cancer. This is one thing I need in my life...as I don't get to, uhmm..you-know-what everyday. Another plus is that it has 86mg of L-Carnitine that helps speed up metabolism. So in short, this variant is great for those who are trying to lose weight! The taste? It tastes like Sprite, a non-carbonated Sprite and I actually like its taste better than the other variant. I've had this for a number of times already (at night, mostly) and it never failed in giving me a bit of "me time" in the CR the following day. But do take note, it doesn't give me the stomach cramps like the one you get when you take laxatives. Our body is capable of producing its own collagen but when we hit 30, the production slows down...and that's the reason why we start to develop wrinkles and lose our skin's moisture and elasticity. Don't lose hope though, as there are many ways to replace collagen in our body. 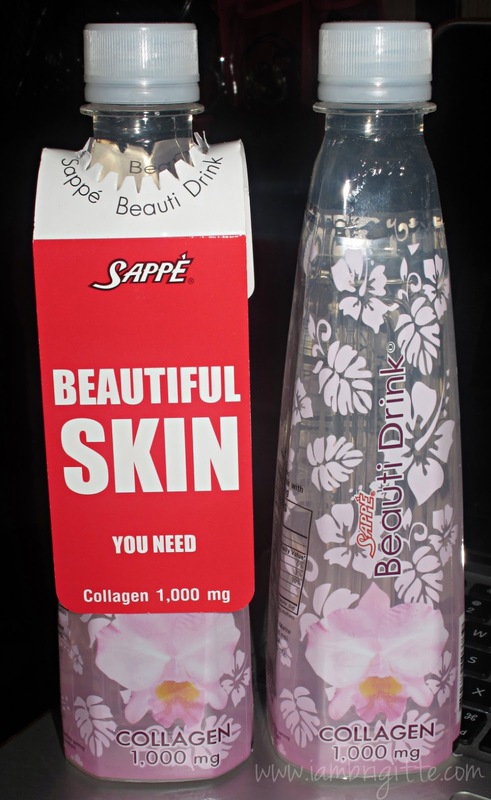 We can pop up pills or gulp a bottle of Sappe Beauti Drink Collagen, which has 1000mg of extracted collagen from deep sea fish. I'll chose the latter anytime! It tastes like an apple drink...well, sort of matabang na apple drink. It tastes okay and I bet, even if tastes funny, I'd still gladly down a bottle if it could help me look young and fresh. Vain kung vain! As for the calorie content, the Collagen variant has 130calories while the L-Carnitine has 90calories. These are priced at less than Php40 each and are available in 7-11. Okay, so I might sound a little antagonistic when talking about these things, but that's because I'm a Molecular Biology and Biotechnology major and I study these things everyday. Believe me, it gets a bit tiring. The fiber drink is legit, fiber does help digestion and there are legitimate advantages to increased intake. One thing to note, however, is that L-Carnitine is innately produced in the body and is not a dietary essential. As such, increasing intakes of it does not necessarily speed up metabolism. There is only so much L-carnitine our body needs and uses, thus drinks promoting L-Carnitie (Plus regular exercise etc etc) on their labels are very misleading. Now onto collagen. Oh boy, I'm going to receive a lot of hate from the beauty community on this, but the principle of ingesting collagen and expecting it to magically find its way to places where you need it is very dodgy, especially if the collagen is not shuttled/tagged to go to the appropriate place. The most likely outcome, seeing as it is a protein, is that it is digested along with all the other proteins we ingest - it finds its way nowhere. Collagen is also produced naturally in the body - but as we age, that production decreases and collagen is gradually broken down. There are drinks that have supplements that BOOST NATURAL COLLAGEN PRODUCTION, but ingesting collagen itself won't exactly do the trick or 'replace collagen in our body'. Topical Collagen creams which are processed to be small enough to be absorbed can sometimes work, but I'm pretty sure these collagen drinks are just a gimmick. There are legit drinks with collagen production supplements in Japan which stimulate your own production of collagen, but I'm afraid this one though is trying to pass it off as something it isn't - the science behind it is just a bit dubious. The most likely explanation as to why most people experience good results after 'drinking this wonder drink' is that they're DRINKING SOMETHING in general. Water or liquid intake on its own does wonders for the skin, and most people don't realize it. The people that give testimonials to these kinds of products' effectivity most likely haven't had regular liquid intake before trying this product, so of course an increase in hydration results in better skin. Hope this clears up some things. I'm merely here to inform. I'm still curious to see if you do experience any good effects on your skin after using this though. Who knows? It might have some secret ingredient we have no idea about. Hi!I am a legit seller of Sappe Beauti Drink. I can give you a much cheaper price. If you are interested, please send an SMS to 09177057118. It is indeed working for me. I have been drinking those 3 for the past 6 months, and believe me, i got a lighter skin tone (which is not normal to me), a healthy scalp with no hair loss anymore(I had a hair loss problem), no saggy skin (since I am 35 years old) and a regular bowel movement (which I normally had indigestion and constipation before).